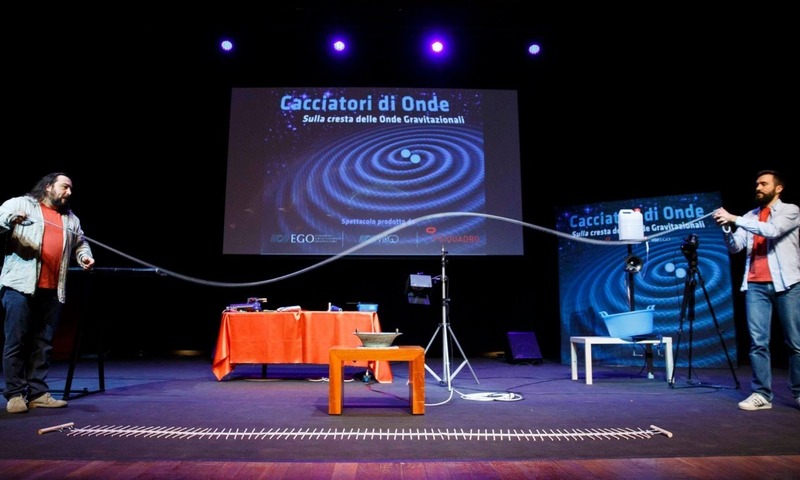 Wave Hunters (Cacciatori di Onde) is a scientific performance that uses surprising experiments and compelling narration to take students along the journey of waves, starting from the most common and easiest ones to gravitational waves, the discovery of which led to the Nobel Prize for Physics in 2017. Alessandro Gnucci and Massimiliano Trevisan will take us by the hand showing how to make waves and vibrations visible. Waves and vibrations are not easily observed and we follow the same path as the VIRGO researchers at the European Gravitational Observatory (EGO) in Cascina, Established by the INFN and the French CNRS. The Italian Public Radio and Television Station, Rai, has selected Wave Hunters for a 30 minute RAI Scuola programme.